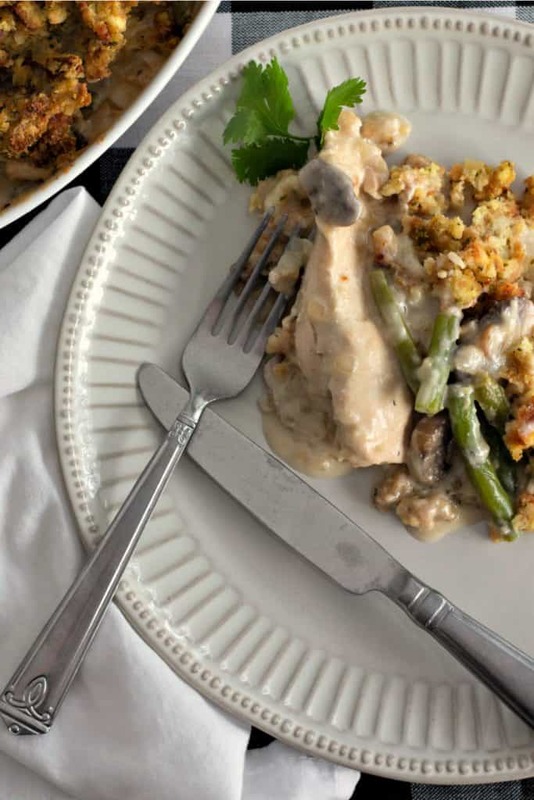 Chicken and Stuffing Casserole is a delicious dish of chicken in a creamy mushroom sauce with fresh green beans and topped with a classic all American favorite stuffing. For the busy cook on the go, put this casserole together the night before and it will keep in the refrigerator until it’s time to bake it the next day. Your whole family will love this make ahead dinner time wonder! 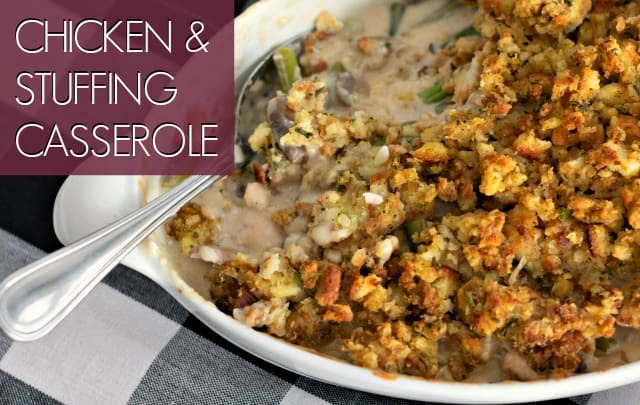 There is just something so perfect about the chicken and stuffing combination. The moist herb filled stuffing with its crispy edges topping tender and juicy chicken breasts smothered in creamy sauce… yes, please! If you came looking for a homemade dinner recipe to satisfy your hungry household, you’re in the right place! When I first put this recipe together, I thought, “I could eat the whole thing!” I did not eat the whole thing… I let my family help! 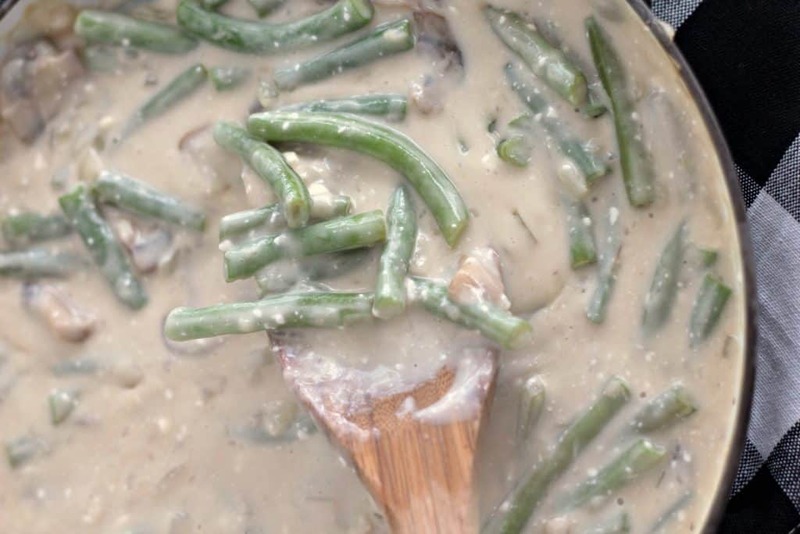 One thing that makes this dish extra delicious is the creamy mushroom sauce. I went for a homemade sauce instead of a canned cream of mushroom soup. 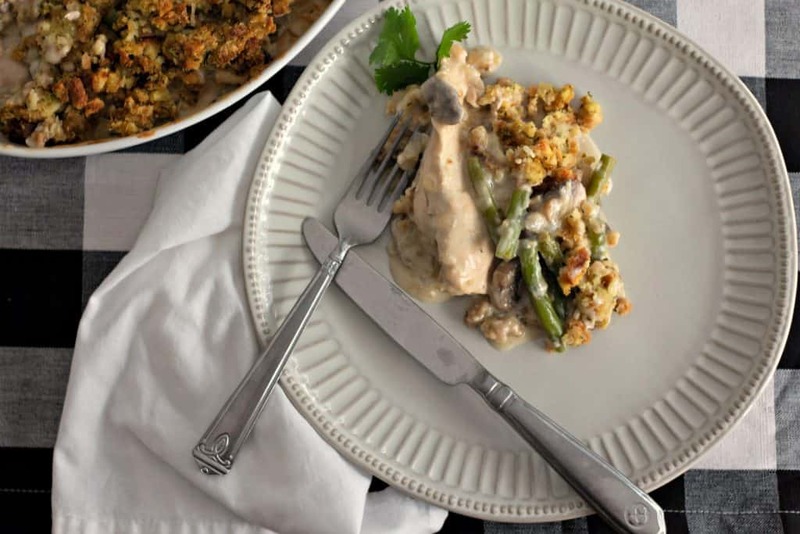 The results are a rich cream sauce that goes so perfectly with the baked chicken and stuffing. 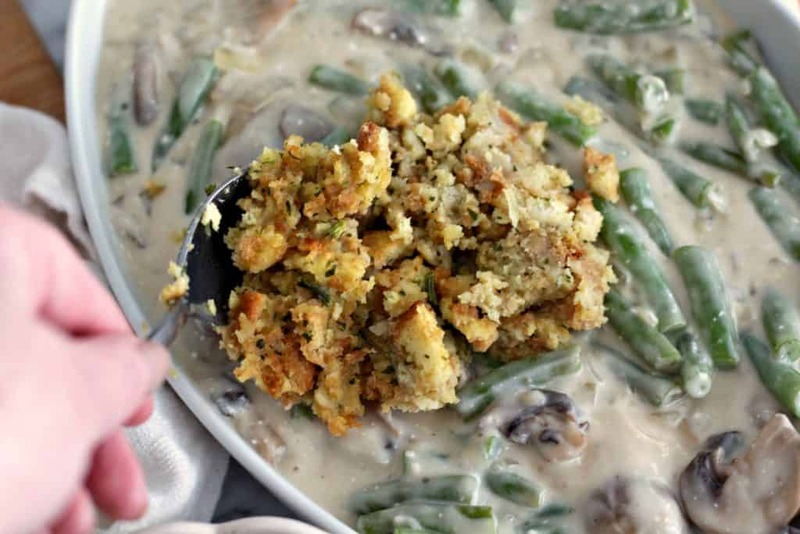 While on the topic of ingredients, I also used fresh green beans and mushrooms in the Chicken and Stuffing Casserole. 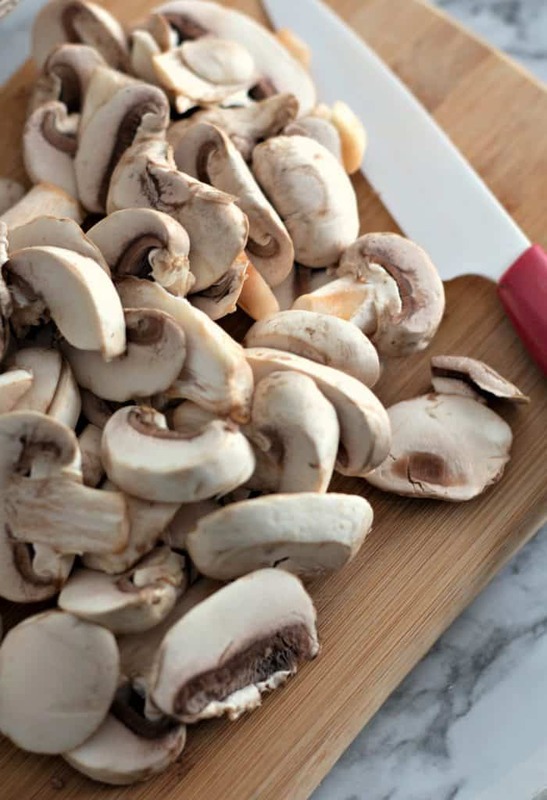 If you or anyone in your family really hates mushrooms, you can leave them out. I actually really don’t enjoy mushrooms at all. I know… I’ve tried so many times to like them! But I don’t mind the mushrooms in this dish at all and just eat around them. I added them because my husband loves mushrooms and I felt they would add great flavor. 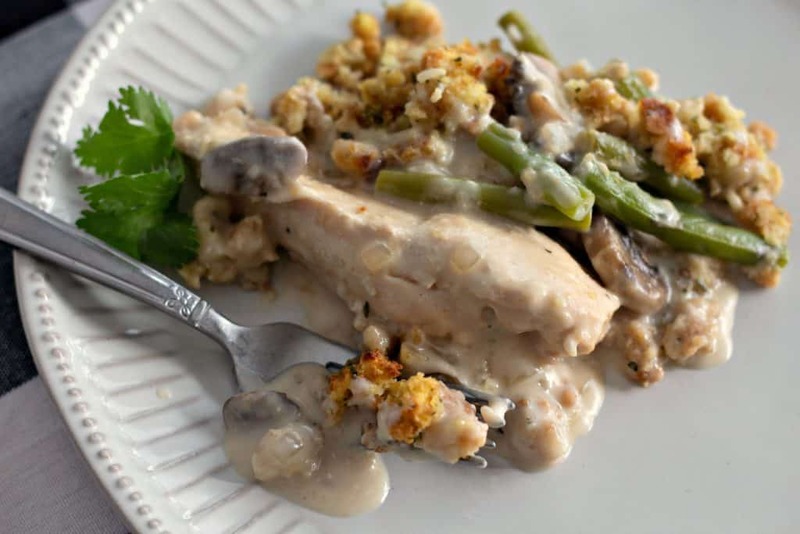 The chicken you use in the casserole should be the big boneless chicken breasts from the grocery store or butcher shop. You’ll cut them completely in half, much like a butterfly cut. 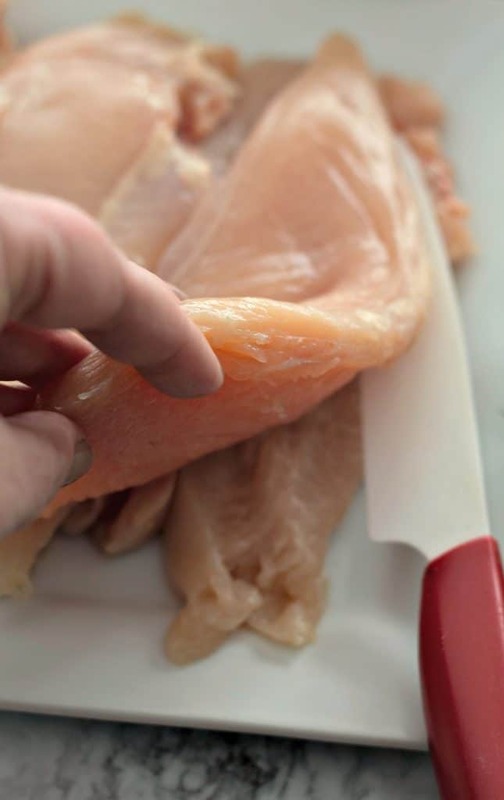 Place the chicken breast on a cutting board, then hold it down firmly with your non-dominant hand while you slice through the chicken breast lengthwise with a knife in your dominant hand. The result will be two thin chicken breast filets. Do be careful that you don’t cut your hand! I find a really sharp knife to be the best for this task. A dull knife will require too much work and “sawing” motion. Before cooking the chicken, season it with some pepper. I do not add salt at this step because other ingredients to be added later will have plenty of salt. It’s always easier to add salt later than take it out! You’ll cook the chicken breasts in a bit of olive oil in a skillet until cooked through. Then they go into the bottom of a casserole dish. 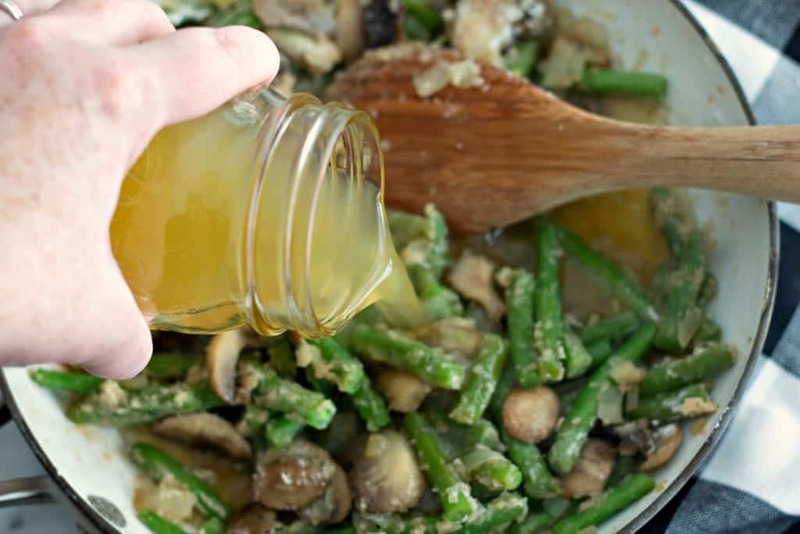 Sauté your fresh green beans, mushrooms, and onions just until they begin to get tender. Don’t overcook them since they will continue cooking in the sauce and also once the casserole is in the oven. 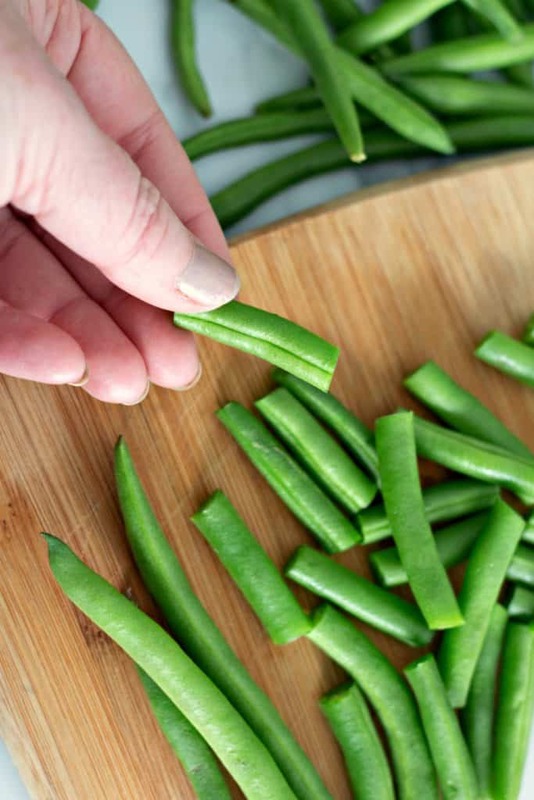 As soon as the veggies are tender (but still have a bit of crunch in the green beans), you’ll add flour and cook it with the vegetables. This may seem like an odd step, but it’s important to cook off the raw flavor in the flour. As the flour cooks, it will sort of clump up and make the veggies look pasty. Don’t worry! This is fine and it will resolve itself during the next steps of the sauce making. After the flour cooks, add chicken stock and stir well. The sauce will thicken as it cooks. Next, add cubed cream cheese. I allow it to melt a bit before stirring it into the sauce. I would take this homemade sauce over a can of cream of mushroom soup any day! As I poured the creamy sauce over the chicken in the casserole dish, I knew this was going to be a winner! Feel free to use whatever stuffing you like best. 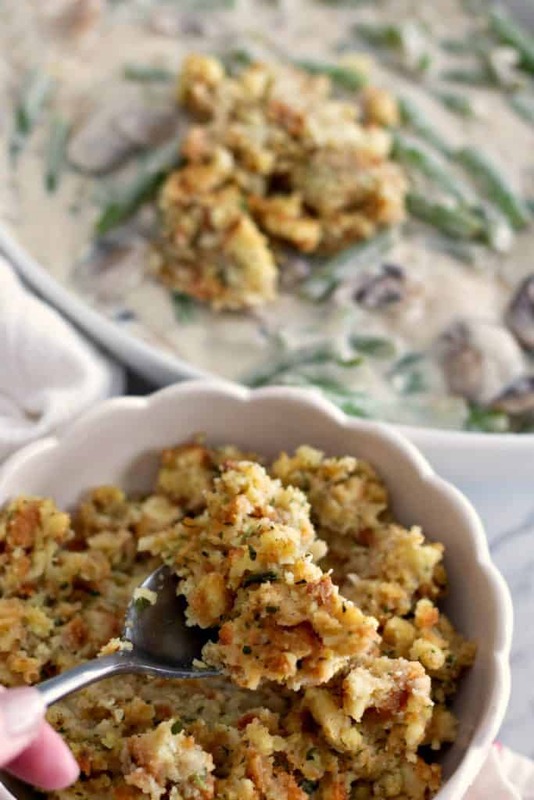 This is a fantastic way to use up leftover stuffing. 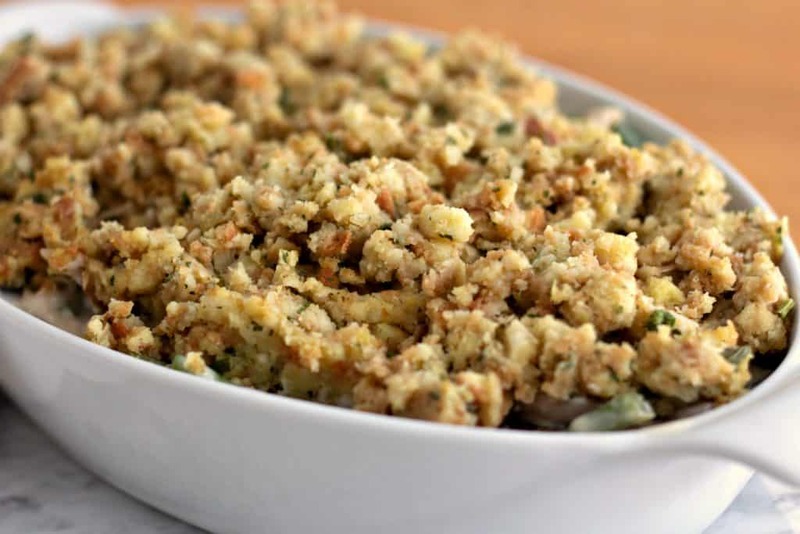 But usually we don’t have “leftover stuffing” outside of the day after Thanksgiving. So I went for the old classic, Stove Top Stuffing. The chicken flavor variety is perfect! It’s easy to make in minutes on the stove by following the package directions. One box made the right amount to top the Chicken and Stuffing Casserole. Now, here’s where you can take a detour. If you are ready to serve dinner now, go ahead and bake the casserole. However, this casserole is just fine to hang out in your fridge until you bake it the next day. You can cover the unbaked casserole, store it in the refrigerator, then bring it out to bake the next day. Love it! The finished product is a comfort food classic. 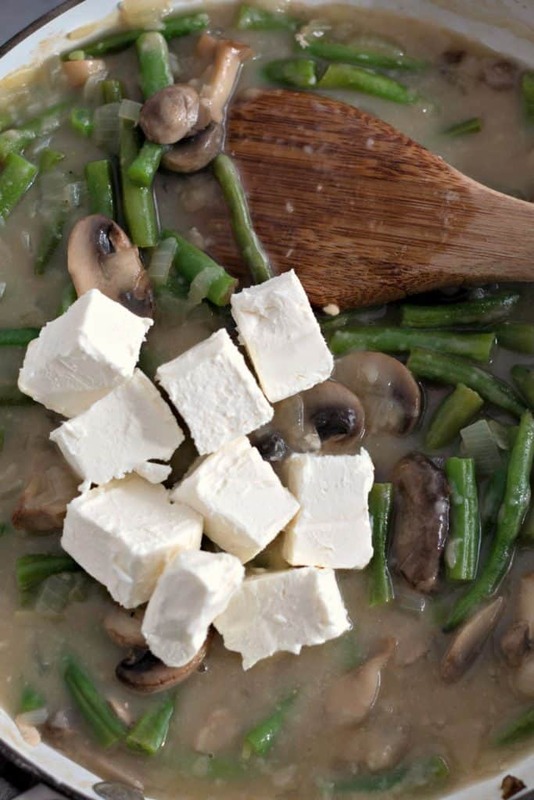 Bring the water and 4 tablespoons of butter to a boil in a medium sauce pan over medium-high heat. Add the stuffing mix and stir well. Remove from heat and allow to sit for 5 minutes before fluffing with a fork. 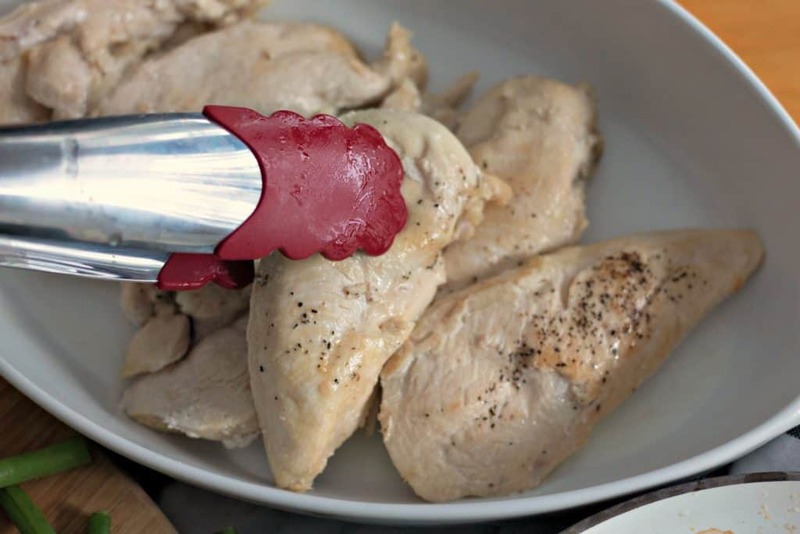 Cut each chicken breast in half lengthwise to make 6 thin chicken breasts. 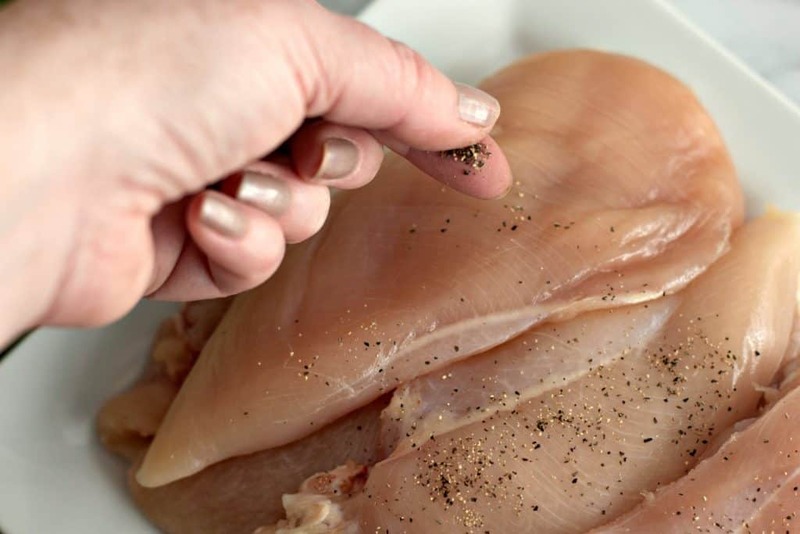 Season each chicken breast on both sides with ground black pepper (the amount you use is up to you). Melt 1 tablespoon of butter in a large skillet over medium heat. Add the chicken breasts and cook on each side for about 5 minutes, until the internal temperature of each chicken breast reaches 165 degrees. Remove the chicken breasts from the pan and set aside. Do not discard the butter and chicken juices in the pan. 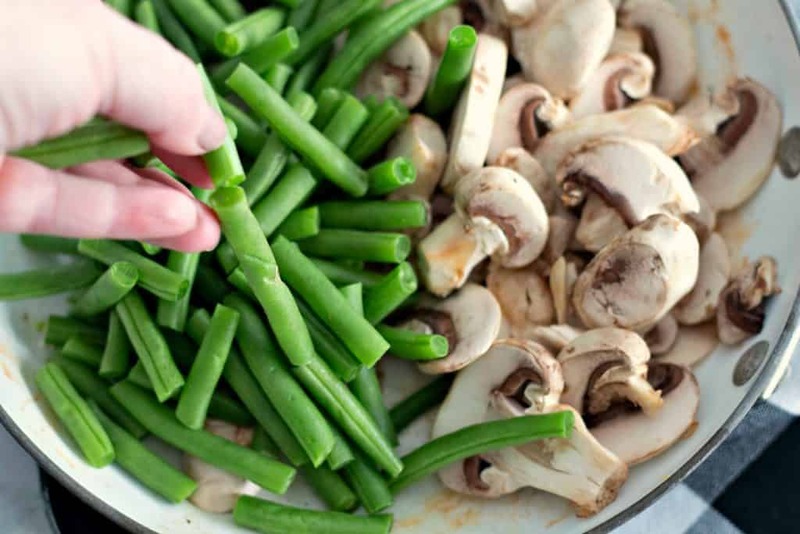 Add the green beans, mushrooms, and onion to the pan; Cover and cook over medium heat for 8 minutes, or until the vegetables are beginning to become tender. 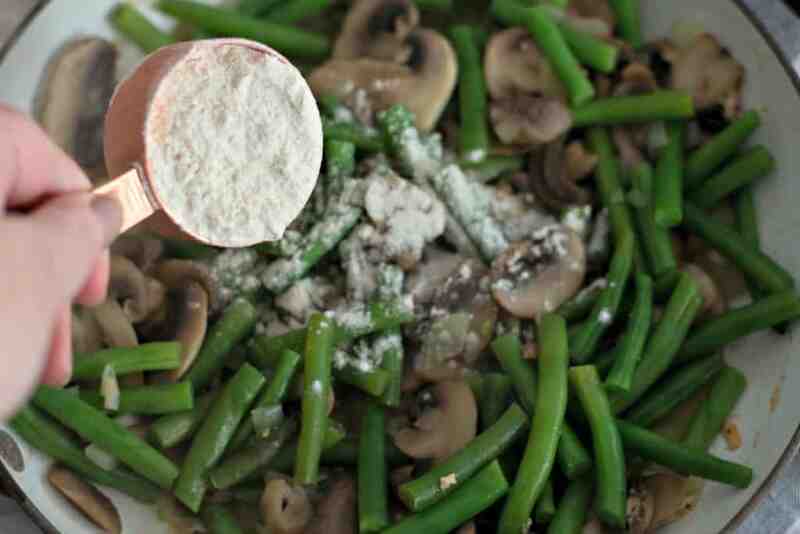 Add ¼ cup flour to the vegetables and stir well (the flour will stick to the vegetables, which is fine). Cook over medium heat for 1 minute, stirring constantly to prevent the flour from burning. Add the chicken broth and stir well. Cook for 3 minutes over medium heat until the sauce is thickened. Add the cream cheese and stir until melted and combined into the sauce. Grease a 9×13 inch glass baking dish. 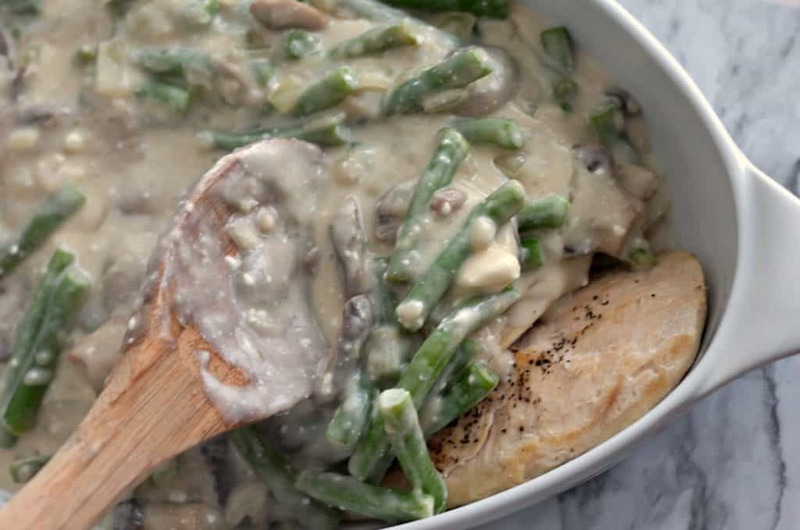 Add the cooked chicken breasts to the baking dish then pour the creamy vegetable sauce over the chicken. Spoon the prepared stuffing evenly over the top of the casserole. Bake the casserole at 400 degrees for 30 minutes. Make ahead instructions: Complete steps 1-8, then cover the casserole tightly with plastic wrap and refrigerate for up to 24 hours before baking. 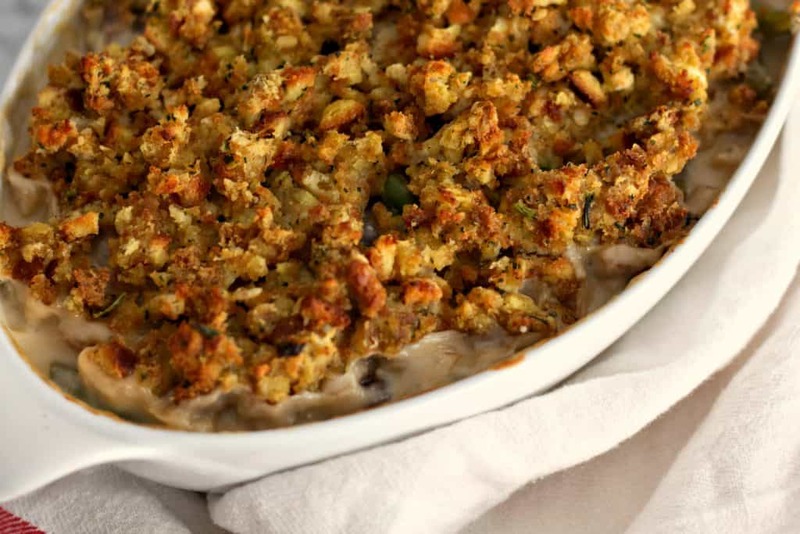 After you make Chicken and Stuffing Casserole in your own kitchen, please come back to tell me how you liked it in the comments below. You can also click here to see this recipe on Pinterest and upload your own picture to the comments. Also feel free to tag me on Instagram at @MomNeedsChocolate. I would love to see your pretty casseroles! 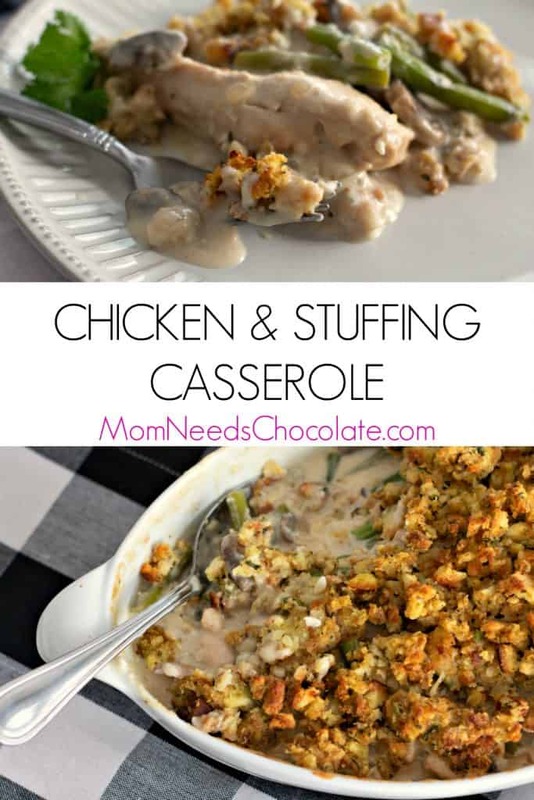 This is a perfect comfort food when you are craving some Thanksgiving flavor! Love this! Simple questions such as “What’s for dinner? 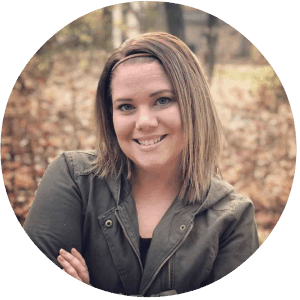 !” can be overwhelming for already stretched-to-the-max busy women. 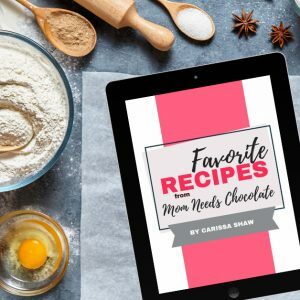 Mom Needs Chocolate exists to help you answer the everyday questions while refueling your energy tank with inspiration, practical life applications, incredibly useful products, and the knowledge that you’re not alone in your efforts to create a beautiful life for yourself and your family. You'll also receive a free e-cookbook by email of our favorite recipes!